In this comprehensive cookbook, you will learn about the glories of shortbread, or Scotch cake, a unique Scottish creation, as well as marvelous rock buns and Dundee cake. Find out how the Scots introduced fried chicken to America and enjoy recipes for happit hen, wet devil, and Scotch grouse. Digest the histories of the Campbell Soup company, Old Crow Bourbon whiskey, and the graham cracker, invented by the eccentric clergyman Sylvester Graham. Try your hand at innovative egg dishes, fish pies, Scottish hot dogs, oatcakes, scones, griddle breads, and crumpets. Finally, make an ale toast at Hogmanay (New Year’s Eve) and ring in the New Year celebrating the many Scottish-American contributions to our daily lives. Seeking to challenge the myth that Scottish cookery is neither interesting nor nutritious, Ms. Shaw Nelson has included a diverse range of recipes sure to satisfy and surprise. 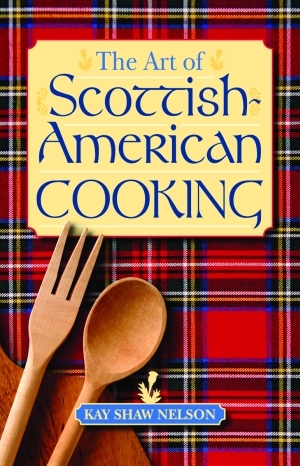 Whether you are nostalgic for Scottish-American food from your childhood or just crave some of the delicious comfort food the Scots invented, The Art of Scottish-American Cooking is a cheerfully compiled guide that will inspire you to make and enjoy a slice of Celtic culture. Kay Shaw Nelson is a nationally recognized writer/researcher of a variety of current and historical subjects. The author of nineteen other cookbooks, she is a newspaper columnist, culinary historian, and contributor to Washington Woman and The Scottish Banner. She is also a frequent lecturer on the history of cookbooks, writers, and travel subjects.